I'm in the final stages of trying to build my first dining room table - a Christmas gift for my wife. All has gone pretty well until this last coat of Arm-R-Seal (Satin). It's the 5th coat, and now, it looks as if the finish has nimbs/bumbs/bubbles in it. Previous coats didn't have this problem and of course it shows up on the final coat. Note, I used an old cotton T-Shirt folded up to wipe on the finish. Here is what the finish looks like now. What do I do to correct this problem? Is it salvageable? What went wrong on this last coat? What do I do to correct this problem? De-nib, then either apply a little fresh finish (tips on that below) or polish up the varnish that's already on the piece. If you don't mind that the surface is more of a satin or semi-gloss the simplest option is to just buff up the surface a bit after you de-nib. How do I de-nib polyurethane after it dries but still maintain its finish? Note especially tip on using brown paper for this! Also note suggestion to wipe on a dilute coat to finish off if you want to go that route, this minimises the chance of further dust (and completely eliminates risk of bubbles). Can't be sure from the photo, could be either bubbles or dust nibs. Most of us really have no control over dust in the air ultimately, even if you build a finishing enclosure/tent in your workspace there will always be some*. Working in a normal room as most of us do you can dust the room carefully, vacuum and then leave for some hours for airborne dust to settle but you'll disturb a bit of it walking into the room, and additionally you can carry some dust in on your body and clothing. This is why in addition to clean rooms professional finishers may also wear a special garment that covers them completely (often including the head) and not their normal clothing which can be loaded with dust. *Although a tent does go a long way towards reducing the risk nearly to nothing. But then wiping your varnish on practically eliminates the problem anyway, without having the hassle or taking up any valuable floor space. a card scraper is really good for removing those nibs/bubbles. It's salvageable, but it will take some work cutting down the finish and then rebuilding it. Not sure. the finish looks like the coats are fairly thick. try diluting the finish 50 % with solvent. that should help. Not the answer you're looking for? Browse other questions tagged finishing sanding refinishing or ask your own question. How do I strip Arm-R-Seal? 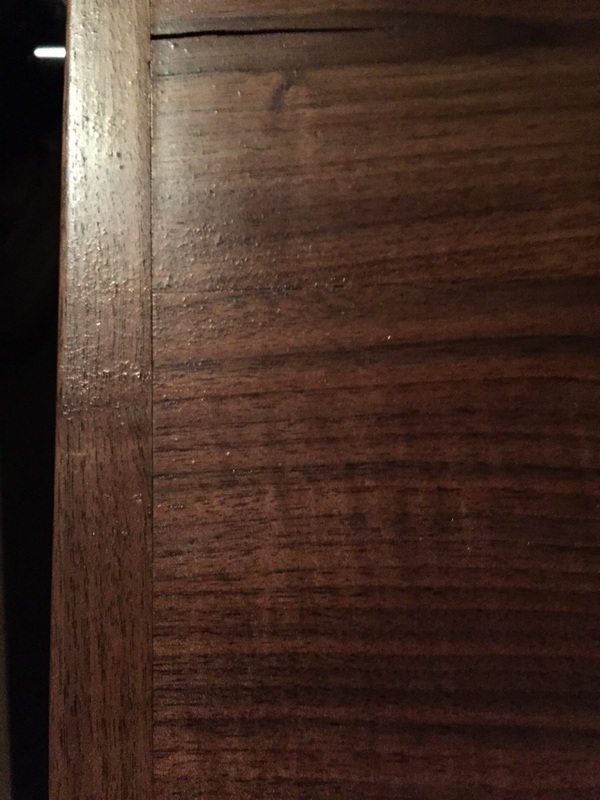 Polyurethane Book Case is Rough, Sand in Place? How are bubbles avoided when brushing on Polyurethane?